John & I stopped at the Glammis Dunes on Sunday and got in two flights… that evening and another in the morning. We camped with the Sod Flyers from Sacramento. They are a very large club with a great Sod farm as their home field. Wealthy guys with lots of trikes. Ken from Oklahoma provided the most entertainment when he tried to launch with his new quad. His wheels were to thin and he had a hell of a time getting enough speed for takeoff. At one point he came down hard and bounced radically from one wheel to another. The quad is a very stable platform. He was able to find some hard pack the next morning and launched without problems. The dune culture is amazing. There are ATVs and dune buggies for all sizes of riders. Convoys of Concert buses and RV’s circled like covered wagons….Sometimes around a mini oval track where pre teens race tiny little dirt trikes. I flew over dunes that looked like ski slopes with huge moguls. 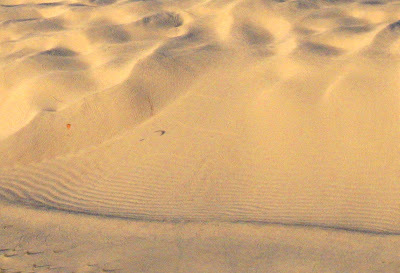 Some of the bigger dunes were so high that you could fly the trough between them a hundred feet below the crest. It’s hard to realize how big they are until you see another wing for perspective. On the way home we stopped at the site of Mo’s Flying Circus. The Fransisco Grande is a great place but the terrain isn’t nearly as interesting as at the Salton Sea. They wouldn’t let us fly at the resort unless we bought a room for the night so we drove a mile north and launch from an open field. The wind was right at the edge of my comfort zone but I got off without any problems. I cut the flight short because the motor was not coming up to power and acted sluggish. Later I discovered that the 1500 feet of altitude change was enough to detune the carburetor. The end of another great trip!